Ermones is a small cove nestling between dramatic hills, studded with a few apartments and a couple of nice looking hotels. Sandy, with some shingle patches. At the edges of the bay are rocks. Yes there are sunbeds available at Ermones beach. Toilets and showers on the beach of Ermones. It is a gentle beach and suitable for children. Parking nearby, but lots of steps down to the beach. On the beach are board walk areas for easier access. The beach is clean, but does have a small stream flowing through the middle that is not too clean. There are no urchins. 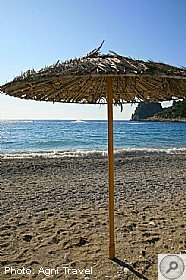 If you are looking for a stunning sandy beach - probably the finest the island has to offer - then Glyfada should be on your list. 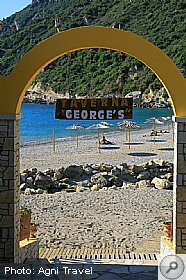 There are several bars and tavernas around the beach as well as the usual hotels and a few apartments. 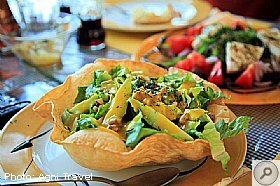 Pelekas can be found on the West coast of Corfu - just opposite Corfu (Kerkyra) town. Pelekas is a large village situated on the top of a hill. 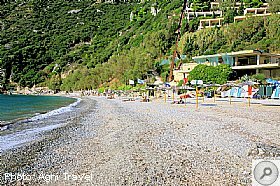 The beach is below the village - about a 10 min walk or a short car journey. There are two large hotels and some apartments blocks. The larger group of apartments have a lift up and down to the beach. 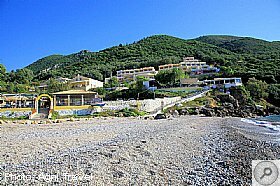 There are three tavernas down at Ermones Beach, and another three up above in the village. There are no bars at Ermones. The tavernas double up as bars during the evening. There are no water sports facilities at Ermones beach. Small sailing boats are on offer, as well as pedalos. There are no tourist shops at Ermones. There is one supermarket in Ermones. There is the possibility to exchange money in the supermarket. There are no public swimming pools at Ermones. Yes, there is a public telephone at Ermones. There are no children's facilities at Ermones. Unfortunately there are no disabled facilities at Ermones. 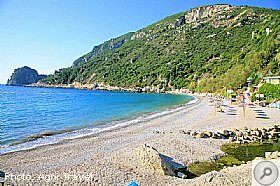 This page focused on: Ermones Corfu. For related information, please visit our Corfu Resorts Guide page. Topic: Taxi Or Car Hire? Taxi between Kalami and airport is 60 euro. We do not hire a car if we visit in June, July or August as cost is higher and it generally just sits on the drive but we find that in May and October it is good to have some flexibility in case of bad weather. May is very quiet so you may be able to request a car from Ermones which could be dropped at the airport on departure. Try Top Cars. View Topic: Taxi Or Car Hire? Next May we will be playing golf as usual in Ermones then having a week in Kalami. 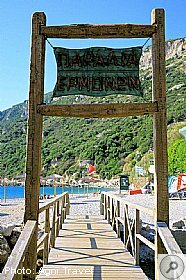 Normally we hire a car (from the airport to Kalami for the week) ... transfers Airport to Ermones are included in golf holiday. Now we are wondering if we should get a taxi from Ermones to Kalami then from Kalami to the airport. Any comments/opinions? Yes, there's a lovely golf course near Ermones in the Ropa valley. There was a similar situation when we were there in May. Rubbish piled at the side of the road from the airport to Ermones. 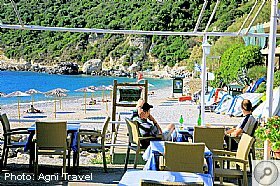 Looking forward to a week's golf near Ermones, then a week at the beach in Kalami...punctuated by trips inland to some of the beautiful villages for lunch. So much to do and see. Hurray booked for next May...a week's golf staying at the Grand Mediteranneo in Ermones, then a week at Dimitiri's in Kalami! Bliss! We are playing golf in the seniors tournament at the end of September, staying at the Grand Mediteranno in Ermones. We have done this a few times and it is always great fun...a bit different from our two weeks R&R in Kalami in June, but just as enjoyable. We are hoping to go to play in the May tournament next year, but flight prices from Newcastle are soooo expensive. Hopefully when easyjet prices come out we can look at going from Manchester. We have just arrived back in Newcastle (and my case and both sets of clubs are in Manchester..more of this later) after a wonderful week playing golf in a hot and sunny Corfu. The Autumn tournament was great fun and "him indoors" even won a prize! The hotel, Grand Mediterranno in Ermones was organised by Ken and was excellent, as were the evenings out and the meals at the club and at Elizabeth's restaurant, Nautico. The price of 633 euros (+plus flights) was great value and included airport and hotel to golf club transfers, B&B 3 hotel evening meals, drinks receptions and wine with certain meals. The company was good and ages ranged from 35 years to 89 years with handicaps across the range of 5 to 34. I would recommend this to any golfer. Various competitions over the week included individual and team stablefords and medals and you could choose to play or not as the mood took you...I chickened out of the individual medal and enjoyed a day on the beach and by the pool. Re the luggage situation...it was a bit surreal. We were sitting on the plane watching the bags being loaded...all safely on board, then "him indoors" said,"they're taking them off" Sure enough the three trolley trailer was re-loaded with our bags and did a lap of the runway, returned to the plane for 15 minutes then set off for another plane then the terminal!!! We were informed (only because we asked) that "because of the heat", the bags were going to Manchester!!! Only about 5% of the bags actually made it to Newcastle...filling only half of the carousel. I phoned Thos Cook to check that the bags would be delivered as promised and asked for a reason, the operator chuckled and said they had been told it was for "operational reasons!" Luckily I have nothing vital in my case...only my make-up is of any real importance! But my better half won't be able to play golf with his mates tomorrow. He won't be bored though...I have a few jobs lined up for him!! Good evening forumites, the question has probably been asked many times but does anyone know if and where you can windsurf on Corfu. My wife and I will be staying in Ermones in July and I would love to know if there was a nearby beach which have these facilities. This page was generated in 5.203 seconds.